Sometimes, a player will run into a good game -- maybe he sees this particular pitcher well or the wind happens to be blowing out in just the right way -- and he'll go deep twice. But there was something about J.J. Matijevic's two-homer game for Class A Advanced Buies Creek on Wednesday that felt different. It may have partially been that it was the second time this season he'd gone deep twice in a game, the first coming April 9 for Class A Quad Cities. Mostly, though, it was because it's easy to draw a line between some of the major moments in Matijevic's baseball career -- adjustments at the University of Arizona, first-time struggles in the Minors and an early-season injury -- straight to Wednesday's power show, and to his early 2018 breakout in general. Start with Matijevic's time with the Wildcats. The left-handed slugger was selected by the Red Sox in the 22nd round of the 2014 Draft out of Norwin High School in North Huntingdon, Pennsylvania, but chose not to sign and instead went to college. Over his first two years in the Pac-12, Matijevic didn't look like a player who would considerably improve his Draft stock. He hit .238 and .287 in his freshman and sophomore seasons, respectively, and didn't post an OPS above .746. His high for home runs was four. But in the summer of 2016 after his sophomore year, he showed signs of a breakout in the prestigious wood-bat Cape Cod Baseball League, where he hit .376/.449/.553 with two homers and nine doubles in 23 games, forcing the many scouts who traversed the league to take notice. He carried that with him back to the NCAA and looked like a new hitter as junior. Matijevic was the Pac-12 batting champ with a .383 average and added 10 homers, a school-record-tying 30 doubles and a 1.069 OPS over 59 games to help claim his spot on Baseball America's All-America second team. There was no doubt that clubs looking to draft Matijevic in 2017 were looking at a new player compared to the one three years earlier, thanks to some mechanical adjustments in his approach to hitting. "I was more controlled in my swing," he said. "I had a lot of movement my freshman and sophomore years, but that third year, I really found something that worked well. There's still some rhythm, but it's a controlled rhythm. I get things moving in my legs and hips and fire through from there. It's worked ever since." MLB.com ranked him as the No. 62 overall Draft talent in the 2017 class, but the first baseman/outfielder fell to the Astros with the 75th pick, the last one made on Day 1 of the Draft and the selection Houston picked up as a result of St. Louis's punishment for its hacking scandal. Matijevic signed for $700,000 -- just below slot for the pick -- and entered an organization that was just about to capture its first World Series title with a large core of homegrown talent. But even with his swing improved over his final spring in Tucson, the slugger had more growing pains to come in the Minor Leagues. Despite his previous track record with a wood bat, Matijevic found it difficult to translate his collegiate results to his first stop at Class A Short Season Tri-City. He produced just a .240/.302/.400 line with six homers and 60 strikeouts in 53 games. The power was a saving grace of sorts, as he was basically a league-average hitter in the New York-Penn League with a 106 wRC+, but that was a far cry from the potential he had shown in the spring. A move to Class A Quad Cities did little for confidence, as Matijevic went 7-for-48 (.146) with 16 strikeouts in 12 games between the regular season and playoffs. The diagnosis: Matijevic was facing more advanced pitching than he'd even seen on the Cape or in the NCAA -- pitching that was showing better stuff and working outside the zone to get him out. Initially, he found it difficult to cope. "As soon as I got into pro ball, I noticed it," Matijevic said. "Adding in all the Latino pitchers, it's like you're facing a Friday guy every day of the week. It was really eye-opening. But I got used to it, and I tried to get better. Luckily, I'm in the best organization in baseball with some of the best coaches in baseball, and they've helped me grow." The prescription: an offseason of bulking up followed by a spring focused on plate discipline. The 6-foot player, who was moving exclusively to left field in the pros, checked the first off by adding 25 pounds of muscle during his workouts back home in Pennsylvania. He saw results in controlled environments after reporting to his first Spring Training at Astros camp in West Palm Beach, Florida, but the physical improvement alone wouldn't ensure that Matijevic could tap into the potential he showed during his junior year. The Astros focused their No. 24 prospect on not chasing the balls out of the zone that New York-Penn and Midwest League pitchers had thrown him consistently the year before. "I'd say it all really comes to making good swing decisions," Matijevic said. "That's a big thing with all of the Astros hitting instructors and coaches. They want to make sure you're swinging at the right pitches. I felt like I've done a better job of it and [I'm] doing my best not to get myself out." The Astros put that approach to the test by sending him back to Quad Cities to open 2018. He quickly dominated, hitting two homers in his third game back with the River Bandits and producing a .354/.448/.708 slash line with as many extra-base hits (10) as strikeouts over 13 games before a promotion to Buies Creek on May 8. Matijevic's 1.155 OPS and 211 wRC+ are still the highest among Midwest League batters with at least 50 plate appearances this season. In hindsight, a move to Class A for a former second-team All-American was a rather passive season-opening assignment, but after Matijevic's struggles in the pro ranks, the Astros wanted him to at least have some foundation for success before moving on -- a message he read loud and clear. "It wasn't a big deal for me at all," Matijevic said. "I knew [Quad Cities] had a good hitting [coach] in Dillon Lawson, and I really liked working with him. But really for me, it didn't matter where I started, so long as I got to play baseball. I knew if I did well, I'd move quickly. That's what made getting hurt so bad." Indeed, during his time with the River Bandits, Matijevic picked up a hamstring injury that put him on the disabled list for two weeks. "That was the first time I'd ever been hurt playing baseball before," Matijevic said. "But I was telling coaches the other day, that might have been the best thing to happen to me in this game. I didn't know how to handle being away like that, and that forced me to figure it out -- get into a routine, get in all my stretches." Matijevic proved he was 100 percent by going 6-for-12 with a homer and three doubles in his first three games back after the injury and was moved up right after that stretch. He's had no issues carrying that momentum with him to the Carolina League, where he's hitting .328/.344/.655 with 10 extra-base hits in 14 games. 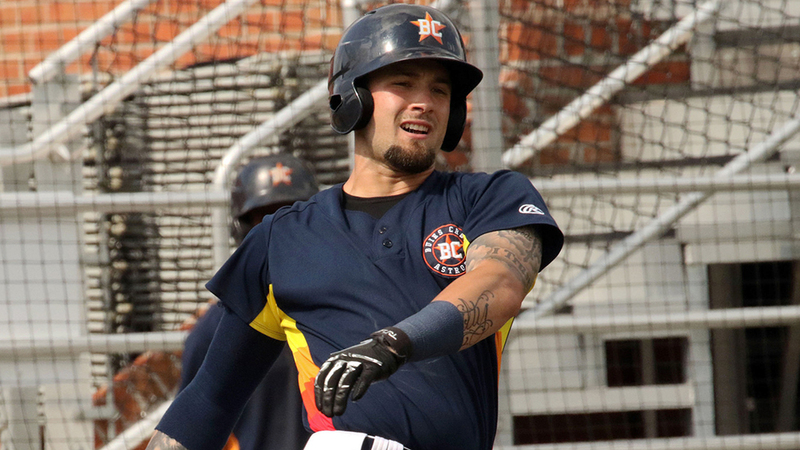 It might be the lower levels, but Matijevic ranks fourth among Astros farmhands with 20 extra-base hits between his two stops this season. That's more than Kyle Tucker (19) or Yordan Alvarez (14) -- Houston's two position-player representatives among MLB.com's Top 100 Prospects. As for plate discipline, Matijevic has cut his swing-and-miss rate from 16.4 percent at Tri-City last season to 13.4 percent with Quad Cities and 12.7 percent at Buies Creek in 2018, as of Wednesday. He still works on making sure his batting stance is under control. He now focuses more on body maintenance to keep the DL demons at bay. But more than anything, Matijevic is learning he just needs to get out of his own way and show that he could be the next impressive hitter in a system loaded with them. "That was my problem last year," he said. "I'd swing at a lot of balls and get myself in trouble. I'm trying not to do that now."